Now that the semester has started, there is so much to remember as you get back in the swing of things. Need a little help with some Stata basics? Look no further than these excellent cheat sheets by data practitioners Dr. Tim Essam and Dr. Laura Hughes. 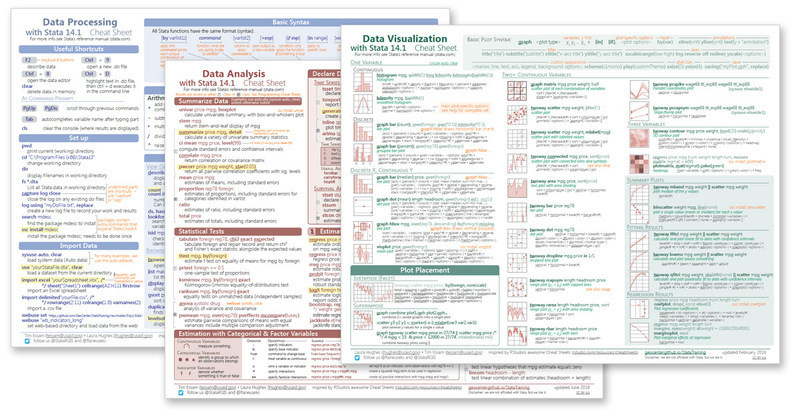 Developed for their online course "Fundamentals of data analysis and visualization", Essam and Hughes made the cheat sheets freely available on their website. The compact yet well-organized sheets cover everything you need, from syntax and data processing to plotting and programming, making them handy references to download for quick use. Want a little more? Then take some time to go through Essam and Hughes's four-part course, which is posted as slides that you can click through at your own pace. Each lesson is accompanied by exercises, homework, and answers to reinforce your knowledge.